My original plan was to make the drawer today, but that plan didn’t take into account things like drying time on glues given the current low temperatures. Titebond PVA glue would be grand, but hide glue is something I’m still figuring out, so I’m giving it lots of margin for error. 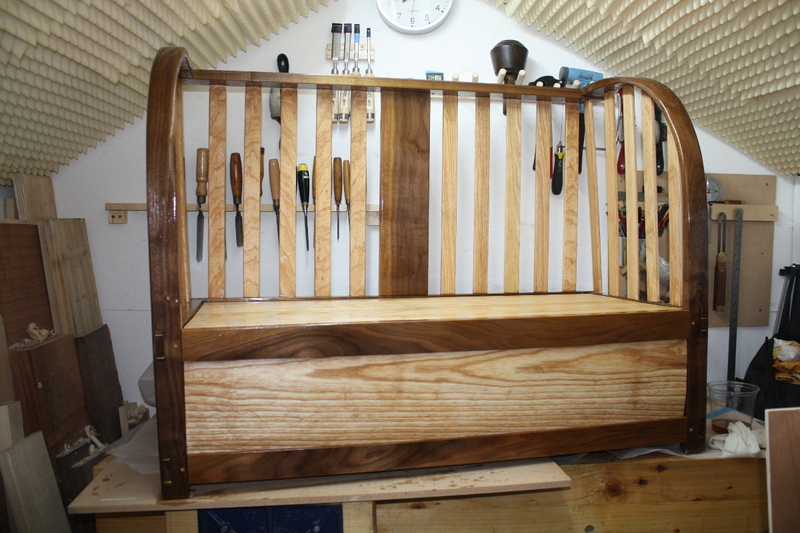 Especially as I found today that I almost had a major error during the glue-up; the use of a mallet to drive the top crossbar and back support into the mortice put torsion stress on the two end joints, as I knew it would (stupid mis-steam-bent upright) but I thought it’d be safe enough. I might just try to get a little glue in there and clamp it closed tomorrow, just to be safe. 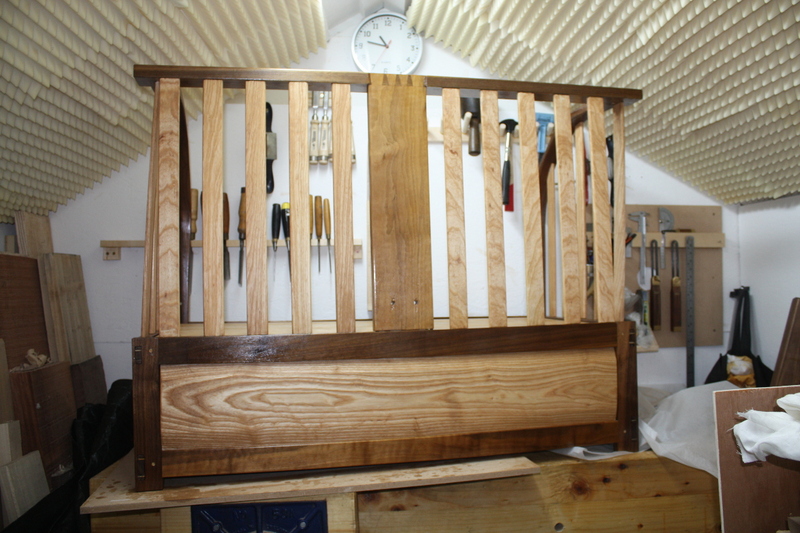 Meanwhile, the rest of today went on getting the frame out of the shed onto the assembly table in the late afternoon, getting all the clamps off and holding my breath to see if the glue had cured (it had), and doing the last bits of trimming on drawbore pegs and the like. 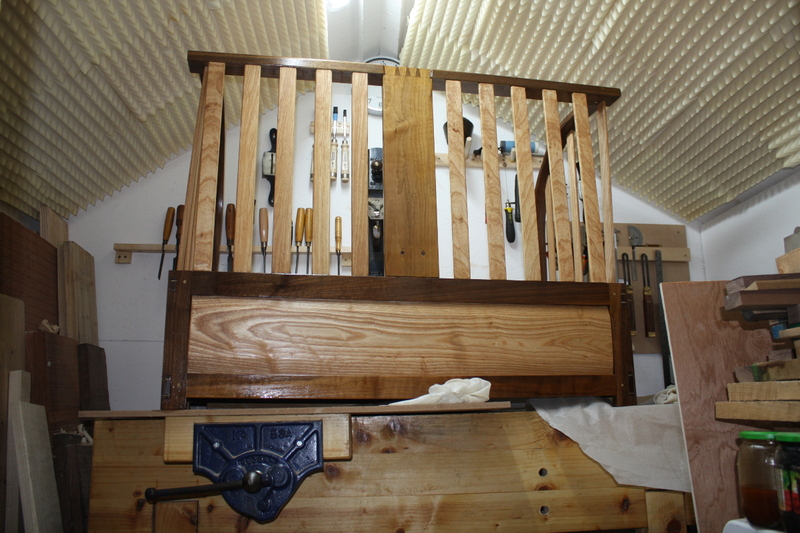 And then the last coat of shellac got touched on in a few places to cover some scratches and once that had dried (it dries fast outdoors), I moved it back into the shed as it was dark outside by now, and got the first coat of osmo going. Just ragging on a thickish first coat here, in two parts (you can see the contrast here between the untreated side panel and the just-treated top panel). The plan was, on with the first ragging, leave for 30 minutes, rag off the excess and immediately on with another ragging, wait 30 more minutes, then rag off the excess again and leave to cure until tomorrow evening. Then tomorrow, I’ll take 400grit paper or wire wool to it, and rag on a thinner coat, leave for 30 minutes, then rag off the excess, then leave to dry until the next day, and we’ll do at least four coats of that. In the meantime, I’ve a drawer to make up as well. 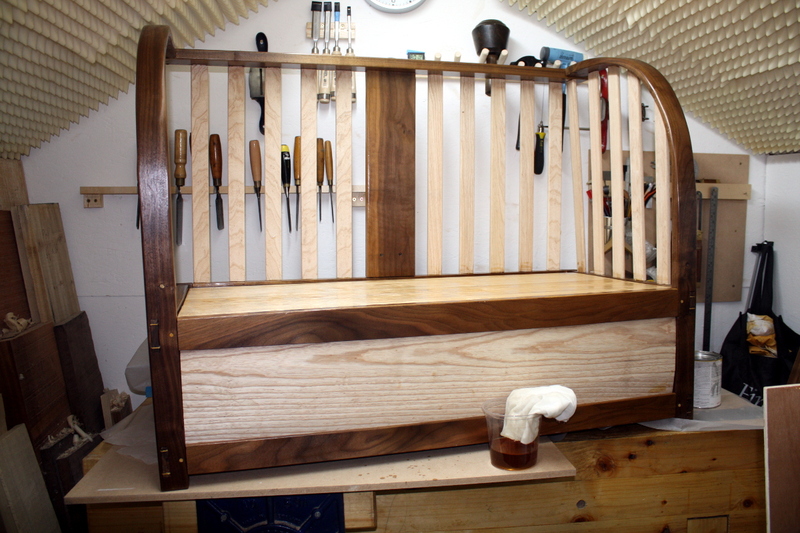 Finish drawer front with shellac. Paint drawer sides with milk paint. Last minute fettling and foostering.